Results are very rare. Today was a short special out of the beach town Vlore. We rode on a military camp, along the rocky coast and finished on a grassfield by the beach. There was some waiting time so almost everybody had a swim in the sea. I finished 21, Lelle 18, and Henrik within 30. David and Tony didn’t race. This entry was posted in 2011 and tagged Albania, Albanien, Annie, rally. Stages have been gruelling rocky, old roman and paved war tracks. Time keeping is unorganized. I think I’m around 30 general. The other Swedes have had problems, technical and also crashes. David is not racing thursday because of injured hand yesterday. I’m okay, no crash, but my right thumb is taking a lot of beating. This entry was posted in 2011, Rally and tagged Albania, Albanien, Annie, rally. Annie @ 1 min, in the crowd to the right (a glimpse). @ 1:10-1:40 riding on the podium. @ 2:30 behind #186 Lelle Johnsson starting (a glimpse). This entry was posted in 2011, Rally, Video and tagged 2011, Albania, Albanien, Annie, rally, video. 11 o’clock start from the podium in centre of Tirana! It was crowded with bikes, quads, and cars on the Mother Theresa Square. When the podium ceremony started, the speaker got all exited and shouted GO GO GO to all riders. No particular starting order, everybody just raced off! The prologue was a twisty ride on the beach set at 17 kms, but shortened to 1 km because of some Police regulations. While regrouping, we had a quick lunch at a beach restaurant. It was hot so we sat in the shade drinking water and cikes until just minutes before the start. Same wild starting procedure, GO GO GO. I dont know how they managed to keep timing right, but I got 67th. Lelle Jonsson 71st. Henrik Rahm and David Petterson made some mistakes and dropped down. Our rookie Tony Jonsson managed to make two laps and finished really far down the results. This entry was posted in 2011 and tagged Albania, Albanien, rally. All day prepping and getting dokumentation through race administration. Went for a tripmeter/roadbook calibration test ride in town – crazy traffic! Everything was a bit confusing informationwise, but I just cruised and enjoyed the nice hotel garden where the assistance park is situated beside the pool. My Australian friend Garry Connell showed up today (Garry runs team Husaberg Australia where I race the Safari Rally). He had raced the Sardegna Rally in Italy last week and now continued to Albania. Nice to meet him here! 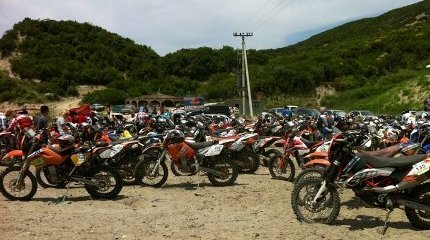 This entry was posted in 2011, Rally and tagged Albania, Albanien, bike, rally. Maste saga att forsta intrycket av Albanien ar bra. Flygplatsen asfalterad, ingen kroppsvistering, det ar rent och snyggt. Taxichaffisen ville direkt gora en deal, att skriva ett kvitto till mitt foretag pa dubbla pengarna, sa delar vi pa overskottet… haha vi skulle alltsa blasa mig pa mina pengar ju! This entry was posted in 2011, Dakar, Rally and tagged Albania, Albanien, rally. Då var det dags för rally igen. Och nu tänkte jag undersöka ett nytt “svart hål” på kartan – nämligen Albanien. Ett land som man inte vet så mycket om, men som faktiskt brukar vara med i Eurovision Song Contest! Det är en stor tävling deltagarmässigt med otroligt många anmälda, hela 169 mc – nästa lika många som i Dakar! Och därtill 20 quad och 50 bilar. Vi är fem svenska som ställer upp: Henrik Rahm och Lelle Jonsson som jag körde skotersafari med i vintras, och offroadentusiasterna David Pettersson och Tony Jonsson. This entry was posted in 2011, Rally and tagged Albania, Albanien, rally. Who has been in Albanina? Nobody that I know. So when I heard about this rally I decided it would be a nice experience to explore a country that I probably would never go to otherwise. On TV it looks like a beautiful country when presented on the Eurovision Song Contest, but I have also heard it is a very nice rally. # 186 Lelle Johnsson – Frihetsbolaget, #234 David Pettersson – Raid Designs, #275 Tony Jonsson, # 160 Henrik Rahm – Highside.se, and me #111. 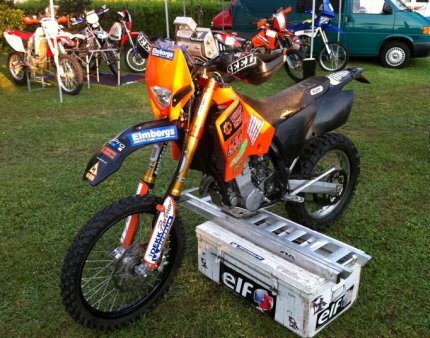 See my rally bike, KTM Super Rocket, ready to rock on YouTube! In the Parc Ferme’ situated in center of Tirana, the teams will be called for technical scrutiny and administrative checks, followed by an official opening party in the garden of the Rogner Hotel. The first competitive Superspecial stage will be run near Tirana. It will be 12 km of timed track that will establish the starting order and also will be added to the total time. Stage one, will be a stage through the mountain area of north-east Albania. Mostly gravel, pave’ and forest routes. In some points the route will go over 2000 m above sea level. Navigation will be reasonably easy in this first stage and then some old asphalt connections to Tropoja. Stage two, is a loop stage, short but technical and surrounded by a breathtaking panoramic mountain terrain. Stage three, will be the longest and most demanding stage of 2011 edition. Navigation skills, and physical and mental endurance are essential for this stage. Going from the extreme north, through the massive mountains until the muddy and slippery hills of south Albania to finish in the Ionian seaside in the city of Vlora. Stage four, is again a loop stage. An relaxed stage along the peninsula of Karaburun with gravel paths five meters from the Ionian seaside. Still, some tricks of the terrain are on the menu. Stage five, will return to Tirana again, and will be the most difficult stage regarding navigation. Through lagoons, rivers and some spider-net paths of central Albania; losing concentration is not allowed! Stage six, is the final stage. Short but everything can happen if rains in the hills and muds around Tirana. Narrow paths, old villages, invisible river beds, mud and dust, will be the landscape of the final rally kilometres…..
After nearly 1500 km of route, more than 900 km comprising timed sections, competitors will be invited to a prize-giving show in the center of Tirana, and then to a party organized Saturday night. This entry was posted in 2011 and tagged Albania, Albanien, rally, rally agenda.